I am thoroughly impressed with the Lawn boy, the machine has completely transformed not only my lawn but also my idea of yard work. I dreaded mowing the lawn; the heavy pushing and pulling left me exhausted afterward. Now, with the Lawn boy I actually enjoy mowing my lawn. Its simple to maneuver and is so easy to push. It's user friendly to those like me who are not accustomed to laborious work. I sometimes struggled starting lawn mowers I have owned in the past; yanking, pulling and priming...with the lawn boy I don't have to worry about that because the machine doesn't have a choke. It amazes me how easily it starts. Not only is it easy to use but it also gives my yard that perfectly manicured look. The wheels are adjustable so you can choose an appropriate length for your yard. The compartment on the back of the mower used to collect grass is simple to use and doesn't take longer than a minute to take off and attach back on. Although it's a bit costly in comparison to other push lawn mowers it is indeed an investment and it even comes with a warranty so it's a win-win situation. The construction, concept and performance of the lawn boy is unparalleled to any other lawn mower I have ever used. The machine is truly built with a great deal of quality and attention to detail. When it comes to lawn mowers I have realized you really get what you pay for; and the lawnboy is the "creme de la creme" of lawnmowers. I have had mine for quite a while now and it still works as great as the first day I bought it. I have used the Lawn Boy 10765 for one summer and I must say I am fairly pleased with it. The mower runs great and in my opinion is good on gas; I could usually get two and a half cuts on my lawn on a single tank. 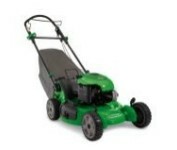 The mower is self is built with care and is made of good parts; this is not a cheap lawn mower. It’s selling for just over $500.00 and is well worth it as I believe that it will last you for many years. Another nice thing is that the mower came with a grass bag, but when the grass is thick the hole that the grass passes through has tendency to get jammed up and you have to clear the way for the grass. Also when the bag begins to fill the mower becomes hard to navigate. The mower does come with solid hand grips so that weight is not impossible to navigate like it would be with some other mowers. When it comes to starting the Lawn boy it always would start for me I never had a problem, the only problem I had was when I tried to start the mower without any gas left.